This last year has certainly been a bumper genealogy year for me. I have just reviewed my Genealogy Goals for 2012, which I wrote on 12th January 2012 and although I knew there were several goals that I hadn't achieved, I was pleased to see that I managed to achieve quite a few of them. At the start of the year, I joined the Association of Professional Genealogists (APG), as I wanted to be part of a professional genealogy association and at the time I didn't feel ready to join as a full member of AGRA. Joining APG turned out to be a great idea, as their President, Kenyatta Berry, invited any APG members (and some non members too! ), to a fabulous networking drinks and supper event at Pizza Express on the Saturday evening after the February Who Do You Think You Are Live show. This turned out to be a great event for catching up socially with many genealogy friends and colleagues. I also started writing up my husband's ancestry, which I have researched thoroughly but have got stuck with a "brick wall" in London! This project still isn't finished because client work took precedence - I hope to be able to proceed with this in 2013. In February I attended the WDTYTA Live exhibition as usual, but this year, for the first time, I helped out on the Ask An Expert stand, where I found that I was able to help others either starting out, or who had got stuck in a particular area. As well as attending several interesting talks and meeting quite a few of my Twitter genealogy friends for the first time (thanks to the rosettes provided by Else Churchill of the Society of Genealogists), I also managed to catch this photo of some of the staff of my local archives, the Surrey History Centre, as they were nominated Archive of the Year, by Nick Barratt and his team at Your Family History magazine. It was also in February that I received the death certificate for John Charles Clifford, who turned out to be my criminal ancestor, James (not John) Charles Clifford, and which started my search among convict, prisoner and Old Bailey records - see separate post about how the death certificate lead me to find out about this criminal ancestor of mine. In March I started research for a new client, into three generations of "well-to-do" lawyers who had trained at Lincoln's Inn in London. I was able to produce a very detailed report for my client, who knew very little about their late grandfather, other than the fact that he had been a judge in Sudan. I managed to find out plenty of genealogical information, going back three generations, and back this up with school and university records, passenger records, Wills and plenty more. Later in the year, I was able to co-ordinate the presentation of my findings with a visit of Lincoln's Inn for my client, organised by the Society of Genealogists (see July below). In April, thanks to a referral from house historian, Ellen Leslie, I started researching a Scottish / English family, for clients who knew very little of the family background of their late father. They had been searching for years and had more or less given up ever tracking down his mother, whose name they knew, and Will they had, but very little else. At Easter, I was delighted to be able to tell them that their grandmother was in the 1911 Scottish census, living in Edinburgh. The final proof came when I compared the signature on her Will, with that on the death certificate of her mother, whose death she had registered. This then opened up a whole new research project, researching merchant seamen records at the National Archives, scouring newspaper articles from China, Canada and elsewhere as well as English, Scottish and Canadian genealogy records. I also attended a tour of the Parliamentary Archives, courtesy of London Historians. The tour was guided by the very helpful and enthusiastic Caroline Shenton, archivist at the Parliamentary Archives. The highlight of this tour was visiting the storage of very old parchment records, which are stored in the circular Victoria tower (see photo left). I haven't yet used the Parliamentary Archives for research purposes, but hope to have an opportunity of doing so soon. In May I attended a "Behind the Scenes Tour" of The National Archives, again courtesy of London Historians. I had taken this tour before, many years ago, but much had changed. A particular highlight was seeing all the wonderful preservation work that goes on behind the scenes. I really enjoy my trips to the National Archives, and a particular highlight is to watch the growth of the four baby swans throughout the year this year. I don't seem to have a photo of them in May, but a TNA blog post recorded their early life here. It was also in May that I was invited to join the Education Committee of the Society of Genealogists, by Nick Barratt and Angela Buckley (outgoing and incoming chair respectively). I have since attended my first meeting, have been confirmed as a fully fledged member of this Committee, and hope to be able to make a significant contribution in 2013. In June I was pretty busy with client research and finishing off their reports. At one point I remember feeling a bit overwhelmed by having five clients on the go at once, two of which involved writing quite lengthy reports. I resolved not to get myself into that situation again! I found myself at the London Metropolitan Archives on two occasions this month, meeting up on the first occasion with a genealogy client from Canada and on the second with amateur genealogist, twitter friend, writer and blogger Suzie Grogan. Suzie was researching her own ancestor, Sarah Hardiman, who spent fifty three years locked up in the Banstead mental asylum. I sat next to Suzie as she turned the pages of the admission and discharge ledgers of this Asylum and we gazed in horror at the number of women who had been locked up for reasons such as "disappointed in marriage". Suzie has blogged further about poor Sarah Hardiman's story here. In July I met up with Liz Doyle of Customised Heritage Tours of Australia, who was visiting the UK with a couple of her clients for their family history journeys. I had earlier researched the ancestry of one of these clients, whose family had centred around Chipstead and Banstead in Surrey in the early 1800's. By chance I have friend who lives in Chipstead and who had contributed to book about the history of the village. So we all met up for a pub lunch, discussed Chipstead historical matters, and I presented the client with a copy of the Chipstead book. It was great fun. I also visited Lincoln's Inn, courtesy of the Society of Genealogists, with the client I mentioned earlier. The tour was most interesting and the buildings were amazing. I was particularly struck by The Great Hall, with its enormous painting by G.F. Watts, entitled "Justice" (see photo left). G F Watts (1807 - 1904) spent much of his life in Compton, Surrey and the Watts Gallery, which has recently been refurbished to a high standard, is well worth a visit if you are ever in the area. I visited TNA several times in July for various client research projects. In early July, I managed to combine my visit with an evening talk organised by the Friends, entitled The Silken Trail, where Professor the Lord Hennessy of Nympsfield, President of the Friends of The National Archives and Professor Lisa Jardine CBE, non-executive Director of the National Archives, explored various issues surrounding the value of our archival heritage and the importance of sustaining 'the collective memory of the nation’. At the end of the month, the sun came out (after much rain) and on this visit, for an Australian client, I photographed the baby swans.....they were only two months old and looked much younger (and cuter!) than the photo suggests. In September I started researching the London and Scottish ancestry for my latest Australian client, my sixth Australian client this year. This has proved to be an ongoing project as I help him progress his family tree back beyond the 1760's. It is especially complicated as this particular ancestor not only has a very common name, but he moved around in London, and his family appear to have moved around a lot in Scotland too, as well as being involved with merchants trading in East India and Siam (now Thailand). The highlight of this research to date has been finding two very large bankruptcy files in the National Archives, for both the ancestor in question and a possible cousin, which have given us many clues to follow up in 2013. I have also found the indexes of Wills and Testaments on Scotlandspeople, which are free to view, extremely useful in trying to sort out all the people with similar names! In October I attended the Surrey History Centre open day, which featured yet another "behind the scenes" tour. (In writing this I realise that I have attended several archive tours this year). The Surrey History Centre is a valuable repository for anyone with either rural Surrey, or even urban Surrey (i.e. London south of the Thames), roots. It is also my local archive. An exciting development for 2013 will be the digitisation of many their records, by Ancestry.co.uk. You can see the full list here. I photographed the swans at The National Archives again - this time they were no longer babies, but were maturing well. 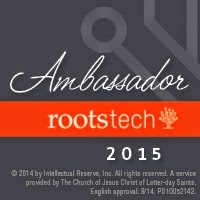 I also booked my trip to Rootstech 2013 in Salt Lake City in March 2013. I am really looking forward to this trip, especially as there are now a few UK "genies" attending. November saw the annual West Surrey FHS Open Day and Family History Fair which takes place every November in the Woking Leisure Centre. I managed to attend a talk on Leather Workers given by Ian Waller at the Society of Genealogists in the morning and then rush back to Woking in time to catch a talk by Sharon Hintze, director of the London Family History Centre, in the afternoon. Sharon Hintze's talks are always informative and amusing and this one was no exception. I also visited the National Archives for some client research (naval records, wills and death duties) and attend an interesting talk given by Kathy Chater on Tracing Your Huguenot Ancestors, which she has written a book about. I admired the four baby swans again... this time they were looking quite mature and starting to fly. At the end of the month, I attended my final talk of the year at the Society of Genealogists. This one was given by Paul Blake and was called "Deptford to Battersea: Researching ancestors from the Southbank". I have ancestors of my own who lived in this area, and many of my clients also have ancestors who lived at least part of their lives south of the river, so this talk was most interesting and relevant. December saw me finalise a number of client research reports, prior to the busy pre-Christmas season. There were no visits of particular genealogical interest, but I did agree to volunteer at the Society of Genealogists' Ask An Expert Stand at the Who Do You Think You Are Live 2013 show at Olympia in February 2013. I look forward to meeting up with many of my genealogy friends there too! Congratulations on all that you have accomplished during what was obviously a busy year. Thanks. Let's make 2013 just as exciting! What a bumper post, I did enjoy reading about your exploits. You have had a stunning year. I look forward to meeting you at Rootstech, there are a few Aussies making the trek so with the Canadians the Commonwealth will have a fair representation. Oh that's super, I look forward to meeting you at Rootstech. You have had an interesting year Rosemary. I look forward to meeting you at WDYTYA and Rootstech where we have a Commonwealth meetup. I look forward to meeting you too. Will you be on a stand at WDYTYA? I also need to thank you as many of blog posts seem to come from referrals from your site!